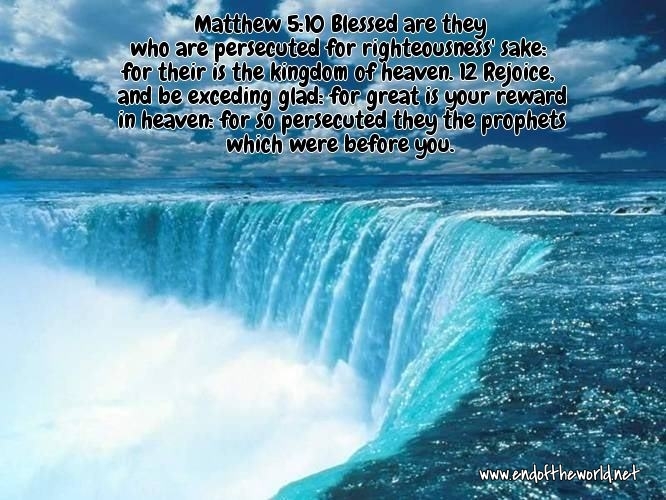 Matthew 5:10 Blessed are they which are persecuted for righteousness’ sake: for theirs is the kingdom of heaven. 11 Blessed are ye, when men shall revile you, and persecute you, and shall say all manner of evil against you falsely, for my sake. 12 Rejoice, and be exceeding glad: for great is your reward in heaven: for so persecuted they the prophets which were before you. 1 John 3:11 For this is the message that ye heard from the beginning, that we should love one another. 12 Not as Cain, who was of that wicked one, and slew his brother. And wherefore slew he him? Because his own works were evil, and his brother’s righteous. 13 Marvel not, my brethren, if the world hate you. Philippians 1:21 – For to me to live is Christ, and to die is gain. America -- The End Looming Possibly Super Near -- Psalms 11:3 If the foundations be destroyed, what can the righteous do?